Posters! « NoveltyHaus ist Macht! Nick DiFabbio’s Super Sick ATOMIC ARCADE and LOCUST DWARF Printed Posters Tonight at 8PMEST! Welcome back, you who are most tastefully excellent! Tonight’s offerings are sure to wow your stellar imagination and charge your brain up to full capacity! This evening at 8PM Eastern Standard Time we will be releasing the first online offering of the final pieces of Nick DiFabbio’s new four color screen printed posters and high resolution laser prints! CLICK HERE TO PURCHASE WHILE SUPPLIES LAST! The first print offered today is “LOCUST DWARF” 16″ x 20″, 4x Color Hand Screen Printed Poster. Printed in Black, Purple, Metallic Silver, and Green inks on a Tan colored heavy cardstock paper. Signed and numbered by DiFabbio in the lower corners! Limited Edition of 200 pieces in this production run. These pieces are sure to add an Earthy Insect touch to your Gestating DiFabbio Collection! $25 plus shipping. Next up is DiFabbio’s “ATOMIC ARCADE” 18″ x 24″, Full Color High Resolution Laserjet Printed Art Poster. Printed in Visible Spectrum Color Toner on a Semi-Gloss White heavy cardstock paper. Signed and numbered by DiFabbio in the lower corners in Black ink! Limited Edition of only 100 pieces! This image was also used as the graphic for the local Baltimore Book Shop, Atomic Books, on their multi-game Arcade Console! Visit them in Maryland! $35 plus shipping. Do you have the Guts to own this print? Show the Monster Inside to the world with this Gnarly Poster! Remaining quantity is visible on the product sale page. Limit 1x Each Poster Per Customer. Yes, please grab one of each! Simply add 1 of each to your shopping cart and checkout both at once to combine shipping! Important note about NoveltyHaus shopping cart: Items are available FIRST CHECKOUT, FIRST SERVED. Items will be available to all customers until checkout has been completed. This ensures that stock quantities are available to all buyers until purchases have been completed. Holding an item in your shopping cart will not ensure your receiving the item until you have successfully completed your purchase. Shipping costs are determined using USPS First-Class/Priority Mail via weight to your destination in the US, First-Class Int’l worldwide. Nick DiFabbio’s POLLY and VISOR WITCH 4 Color Screen Printed Posters Today at 8PMEST! Greetings to you, fan of the excellently insane! Today’s offerings are sure to please your eyeball sockets and stimulate the gruesome cartoon colored inner workings of your soul! This evening at 8PM Eastern Standard Time we will be releasing the first online offering of Nick DiFabbio’s new four color screen printed posters! CLICK HERE TO PURCHASE WHILE SUPPLIES LAST! The first print offered today is “POLLY” 16″ x 20″, 4x Color Hand Screen Printed Poster. Printed in Yellow, White, Brown, and Green inks on a Light Aqua colored heavy cardstock paper. Signed and numbered by DiFabbio in the lower corners! These pieces are sure to add a mind bending, feminine touch to your DiFabbio collection! $25 plus shipping. Next up is DiFabbio’s “VISOR WITCH” 18″ x 24″ 4x Color Hand Screen Printed Poster. Printed in Yellow, Purple, Orange, and Green inks on a Black colored heavy cardstock paper. Signed and numbered by DiFabbio in the lower corners in Black on Black ink! Just your Mojo Juiced Up with this slobbering voodoo bone-eyed witch print! $30 plus shipping. Both prints are limited and numbered to 200 total pieces. Remaining quantity is visible on the product sale page. Limit 1x Each Poster Per Customer. Nick has asked that these prints go to first time buyers, so if you already have a copy of one of these particular prints , please sit this one out. If you don’t have a “Polly” or “Visor Witch” please get one! Shipping costs are determined using USPS Priority Mail via weight to your destination in the US, First-Class Int’l worldwide. Holiday Gift Event Sat. Dec. 19th! Featuring local producers and designers! Come to our Holiday Gift Event! We are excited to invite you to visit our mysterious studio in Hampden, Baltimore to explore and find a Holiday Miracle for your lovies! Our local compatriots, Mandalynn Swim, Monster Lou, Stiffy’s Ceramics, Alchemic Earth Jewelry, Highness Press, and Moonlife Clothing will be joining us to offer you gift options that support small local business and help you avoid the mall! Visit us on your travels for your last minute gifts, then head up to the 36th Avenue and enjoy more unique shopping! We’ll have some light snacks and drinks and a warm holiday atmosphere for you to enjoy! Make an adventure of your day and come visit! Ok? There is a parking lot on Mill Rd that is available for you while you visit us at The Mill Center. The main entrance is on Darby St, just through a black metal gate and under an ivy awning. If you get lost, just call us at 410-343-9282 and we’ll get you in the party! Contact us at info @ noveltyhaus.com with any questions! Celebrate One Year At Our New Location in Hampden with Us at the Golden West Cafe, September 8th! 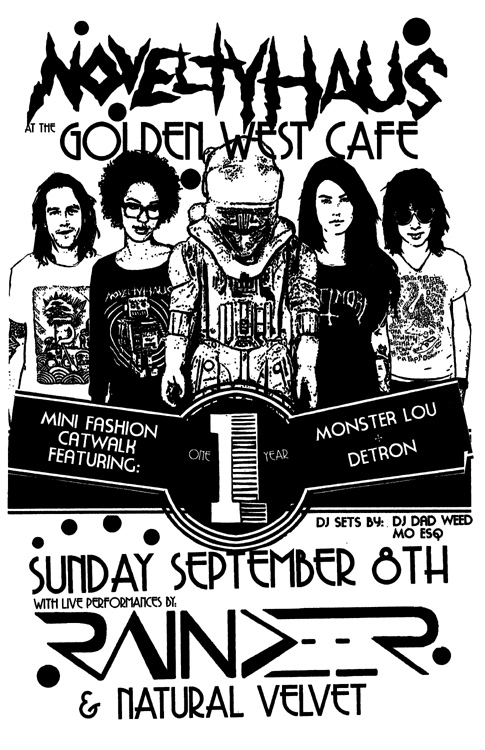 We’ve got a fun event coming up at the Golden West Cafe on Sept. 8th. Live performances by RAINDEER and NATURAL VELVET! DJ Action by DJ Dad Weed and Mo ESQ! MINI FASHION CATWALK FEATURE EVENT! Featuring the stylistic wonder of DETRON and MONSTER LOU! Showcasing upcoming handmade fashion by local designers! Come hang, Get Loose, Get Wild and Celebrate NOVELTYHAUS’ 1ST YEAR at our new location in Hampden!